With Lee out of town, Boo and I took a picnic lunch to the observation deck at the far end of one of our local trails. This has been a favorite destination since she started toddling along for some of our hikes. She planned and made our lunches (PB&J, squeezy apple sauce, and a piece of candy) while I had my coffee. She has a tiny compass on her pack. It’s more of a toy than anything, but it points north-ish, and is a lot more accurate than I was expecting. 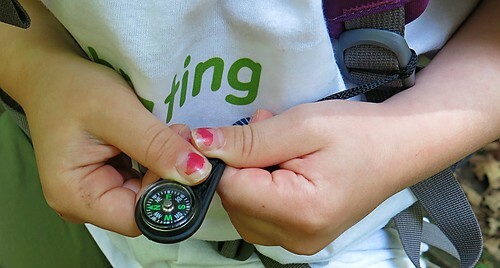 She has gotten to the point where she can look at the compass and point north, and then figure out which was the trail is going next, even if it’s not the direction she’s looking. The last time we took a longer hike here, there were still several trees down across the trail from the flooding. This trail, however, was clear, which was a disappointment to her. She likes to climb over obstacles. She found a tree very close to the path and climbed over it. Then we hit the creek. And the bridge was gone. It’s not deep, and I saw plenty of good ways to cross. I decided to let her figure out her own crossing. We discussed where it might be deep, how to tell how deep it is. She tossed several rocks trying to determine depth. We discussed the benefits of dry socks. 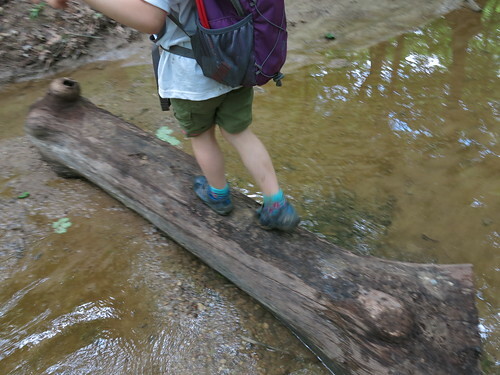 We pondered jumping versus balancing on a log, versus looking for a better crossing location. And she thought and thought and thought. It took her about 10 minutes to get from one bank to the other. It was hard to keep my frustration inside, even though I know she will learn more from trying on her own than following what I tell her to do. She ended up going part way across on a large log, then walking down a gravel bit in the middle, and then going across a large branch (and getting somewhat tangled), and still getting a foot wet. But she was so satisfied for having figured it out herself. 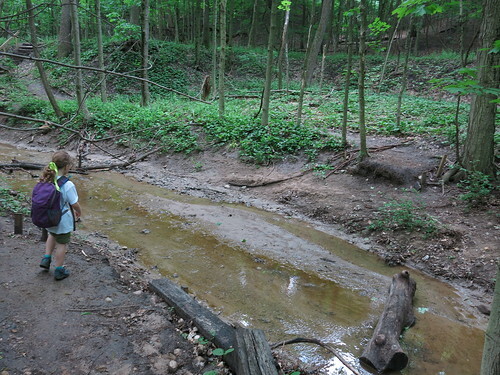 We saw the bridge about 100 yards further downstream, far from the trail, looking like it had been built there. Surreal.